Radon was discovered in 1900 by Friedrich Ernst Dorn in Germany. He found it being released by thorium. Radon is useful for cancer treatment. It is most commonly found in rocks. Radon has an Atomic Mass of 222. It's Atomic Radius is 120 pm. It's density is 9.73 g/l. It's melting point is -71 Degrees Celsius. 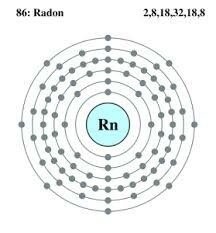 At room temperature, radon is a gas. It is invisible, colorless, and odorless. It is not flammable and has a high reactivity. 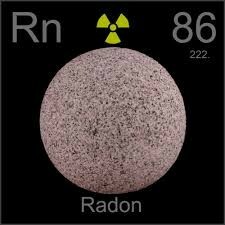 Radon's Atomic Number is 86. It's mass number is 222. It has 86 protons, 136 neutrons, and 86 electrons. Radon-222 is the most common isotope. it is thought t be responsible for 20,000 lung cancer deaths each year. Radon Difluoride is less reactive than many other compounds. 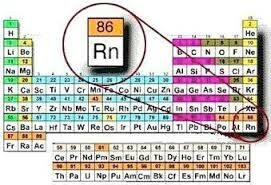 This is where radon is located on the Periodic Table. The name radon comes from the word radium. The symbol for radon is Rn. *It is the heaviest known gas. *The earth's atmosphere is 0.0000000000000000001% radon on average. *The name radon came from the word radium. *Element Card: Gray, Theodore W. (2008). The Photographic Card Deck of the Elements. *Elements Book: Gray, Theodore W. (2009). The Elements: A visual exploration of every known atom in the universe. New York: Black Dog & Leventhal Publishers, Inc.